Dear Guy. I receive my boots today . They are indeed very cool and l like them very much. I would like to thank you deeply . I am very please how things turn out . Once again thank you very much for your service . I will be looking forward to do business. Traditionally work boots have been made of leather. Today work boots are made from many materials. Work boots are worn both for their functionality in protecting the foot and leg from water, snow, mud or hazards or providing additional ankle support for strenuous activities. Lone Star Boots has a great selection of work boots for men from famous boot makers like Justin Boots Men's J-Max Work boot. 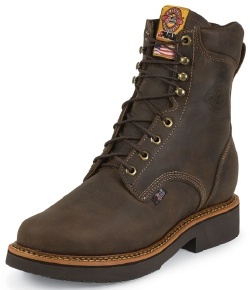 See Lone Star Boots work boot selection below. Browse these categories under "Men's Work Boots"